The Car Show Registration Fee is $25.00 per vehicle, there is no entrance fee for spectators. The 46th Annual Shelby Mustang & Ford Meet will be held at the Festival Grounds in Maggie Valley, North Carolina on Saturday, October 5, 2019 with Sunday, October 6, 2019 the rain date if needed. On site registration will be available on Friday, October 4, 2019 from 1:00 PM to 5:00 PM at the show site. On Saturday, October 5, 2019 the show will be from 8:30 AM to 3:00 PM with registration open until noon. All year’s of Mustangs, Shelbys and Ford bodied and Ford powered vehicles are welcome. As in the past this show will be a popular vote format with awards presentation at 3:00 PM. There will be over 25 classes available with top 3 awards in each class plus awards for Best in Class Early Mustang, Best in Class Late Mustang and the Jim Osborn Award. There will be show T-shirts available for purchase, with last year’s Best of Show Early Mustang; Best of Show Late Mustang and Jim Osborn award winners centered on the back, plus there will be a 50/50 drawing that will benefit Toys for Tots. Additionally there will be numerous door prizes available and awarded throughout the day. For any questions, please contact Steve Harrison at (404)427-2264 or steve66shelby@gmail.com. Once again we will arrange for food and drink to be available at the site. For NE Georgia Mustang Club members and anyone else who would like to join us, we will once again cruise up on Friday, October 4, 2019 by way of the Dillard House Restaurant. If you are interested, we will leave from the QuikTrip at Oakwood, GA at 7:00 AM. The QuikTrip is located at exit 16 (Hwy 53) on Interstate 985. If you prefer, you can meet us at the Dillard house at 8:30. After breakfast we caravan on to Maggie Valley arriving somewhere around noon or so. We usually check out the show site taking care of vendors and any early registrations that may arrive by 5:00 PM on Friday. There are many good places to eat in Maggie Valley and the Club will usually eat dinner somewhere as a group or in groups at several locations. Lodging is available at the host hotel the Comfort Inn. The Comfort Inn is again offering rooms at the special per night rate of $129.00 + $10.00 additional per night for a king bed. To receive this special rate you must contact the Comfort Inn directly at 828-926-9106 use the “NEGMC” code. You must make your reservation by July 31, 2019 or else you will pay the regular per night rate which is currently $209.00 and subject to increase. There are additional accommodations available at Creekside Lodge, Comfort Inn, Best Western, and Microtel unless they are full. If the Maggie Valley hotels are filled there are other hotels in Waynesville, NC which is a few minutes north of the show site. 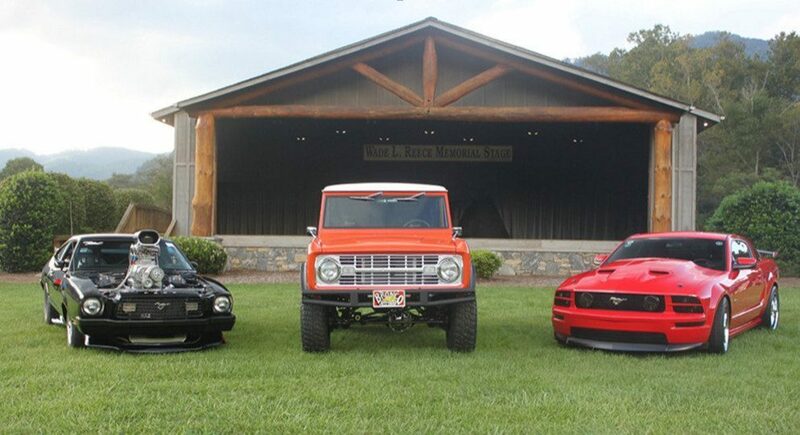 We look forward to seeing you at the NE Georgia Mustang Club’s 46th Annual Show!